The fields and open spaces of Central Massachusetts where farms once flourished are starting to see a new type of crop: ground-mounted photovoltaic solar panels. Undeveloped acreage is becoming a prime site for “solar farms” producing between half a megawatt and around 6 megawatts of power. For example, a half a megawatt solar farm can provide enough electricity to power more than 60 homes a month. Through various ownership or contractual structures, municipalities are tapping into this resource as a way to offset and stabilize energy costs. The simplicity of siting, building and maintaining solar farms, combined with the state and federal financial incentives for renewable energy, make the farms very attractive. Projects are being considered or under way in Douglas, Uxbridge, West Boylston, Barre, Brookfield, Leicester and Northbridge, among others. “Literally dozens (of solar farms) have been proposed around the state or are under development,” said Catherine Williams, communications director at the state Executive Office of Energy and Environmental Affairs. Part of the recent influx of proposals reflects the impending sunset of federal grants for renewable energy projects, which must be in operation or substantially under way by the end of the year, according to several municipal officials. State incentives available through provisions of the Green Communities Act of 2008 also play a role. The incentives allow producers of renewable energy to receive credit for production above what they use. But one of the biggest selling points for towns to embrace solar development is the uncontroversial nature of siting solar arrays on vacant land. “There’s virtually no impact to abutters,” said William J. Cundiff, town engineer in Douglas. DG Clean Power LLC, a Thornton, N.H.-based developer working with Con Edison, broached discussions with the Douglas Board of Selectmen in September about installing a 2.5-megawatt system on 21 acres of privately owned land off Route 16, across from the fire station. Mr. Cundiff said the proposal, once it’s filed, would go through the site-planning review process. However, because there are no noise or visual issues as with wind turbines or other energy, it would be straightforward. DG Clean Power is negotiating on behalf of Con Edison an agreement for payment in lieu of personal property taxes, which includes, besides an annual cash payment, a credit to the town’s electrical bill equal to 10 percent of the Massachusetts Net Excess Generation Credits produced by the solar farm. According to Joseph S. Fitzpatrick, DG Clean Power’s president and CEO, the proposal would provide $1.5 million to the town over 20 years. Mr. Fitzpatrick said he hopes the Douglas solar farm would be approved, installed and operating by May. The same developer is working with Constellation New Energy on a similar arrangement in Uxbridge, involving a PILOT with a portion of net energy credits assigned to offset the town’s electrical costs. The Board of Selectmen approved in June a PILOT agreement with energy credits for a 2.5 megawatt installation at the Uxbridge industrial park. An additional 0.9 megawatt proposal in the same area was on the Board of Selectmen’s agenda last night.According to Uxbridge Finance Director David Genereux, an additional benefit of tying the financial agreement to renewable energy credits is that the credits’ price is based on market costs. “If our electricity costs go up, we’ll have an offset,” he said. Another 4-megawatt commercial solar farm proposed for the site of the former Bangma’s dairy farm in Uxbridge recently received a special permit from the Planning Board, but Mr. Genereux said that project was “up in the air” as far as a town agreement was concerned. Over in West Boylston, a 369-kilowatt solar farm down the road from the Worcester County Jail and House of Correction has provided since November price stability and electricity equivalent to the amount typically used by about 60 homes per month through the West Boylston Municipal Lighting Plant. 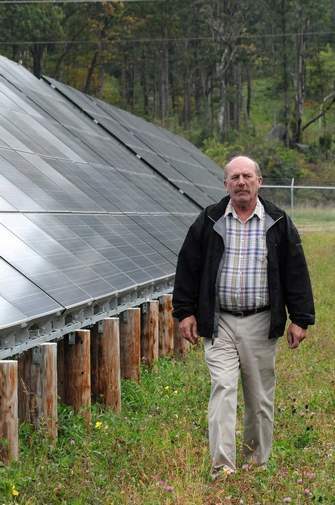 The solar farm is one of the few non-commercially developed installations in the state. It’s structured through a cooperative arrangement involving the West Boylston Municipal Lighting Plant and Massachusetts Municipal Wholesale Electric Co., called the Massachusetts Municipal Light Department Solar Energy Cooperative Corp. He said once the loan for the photovoltaic panels and inverters is paid off, the electricity will be virtually free. Officials figured the project would pay for itself within 20 years, but with solar energy generation credits, the payback could be sooner. Since the photovoltaic panels have no moving parts, there’s little that requires maintenance on the field. Mr. White said that last winter they had to plow the snow off the panels twice because it had built up so high, but usually it slides right off. West Boylston Municipal Lighting pays an average of about 11 cents per kilowatt for its electricity, a competitive price and one that remains stable despite peaks in demand. “The benefit of this is in the middle of August, at 2 p.m. when it’s 90 degrees out and New England is reaching a peak in usage, this (solar farm) is keeping us from having to buy at prices like 50 cents a kilowatt,” Mr. White said.